Inclusion of drugs in provincial drug benefit programs: Who is making these decisions, and are they the right ones? Dr. Laupacis is with the Institute for Clinical Evaluative Sciences, Toronto, and the Departments of Medicine and Health Policy, Management and Evaluation, University of Toronto, Toronto, Ont. He is a Senior Scientist of the Canadian Institutes of Health Research. Over 2 years ago, I joined the Drug Quality and Therapeutics Committee (Therapeutics Committee) of the Ontario Ministry of Health and Long-Term Care. Using mainly cost-effectiveness criteria, the committee suggests to the minister which drugs should be included in the drug benefit program for Ontario residents over the age of 65 years and those on social assistance. Given that resources for health care are limited, it seems sensible to me that cost-effectiveness is the main criterion used to determine which drugs are reimbursed from the public purse. However, some physicians believe that the Therapeutics Committee unreasonably increases the bureaucracy associated with patient care and restricts their ability to prescribe useful medications. In addition, many in the pharmaceutical industry view the committee as having a predominantly cost-containment agenda, and members of the public have complained that the Therapeutics Committee deliberates in private and that patients have no input into the process. In this essay, I describe the organization of the Therapeutics Committee, the annual budget of the Ontario Drug Benefits Program and the major drugs the program funds. I also provide some thoughts about the Therapeutics Committee, in particular, and about the use of information concerning the cost-effectiveness of drugs in general. The Therapeutics Committee consists of 10 physicians and 2 pharmacists selected on the basis of their clinical expertise or ability to interpret economic evaluations, or both. Members usually serve a term of 3–5 years. Manufacturers who wish to have their drug included in the provincial formulary prepare a detailed submission that describes the drug's clinical effectiveness and cost-effectiveness, using a checklist prepared by the committee. Each submission is reviewed by 2 or more external consultants and 1–2 committee members. They are asked to take a societal point of view and not to focus only on the budget of the Ontario Drug Benefits Program. For each drug, the committee has 3 options: General Benefit, Limited Use and a third category, known as Section 8. Approval as a “General Benefit” drug means that the cost of the drug is reimbursed for all patients with no restrictions. “Limited Use” means that the cost of the drug is reimbursed only for patients who meet certain clinical criteria. Physicians must confirm that patients meet these criteria by signing a special prescription form and entering a number that corresponds to the Limited Use criterion. If the drug is not in either of these 2 categories, it will not be paid for unless a special written request indicating the reason why the drug is required for a particular patient is sent to the Drug Programs Branch of the Ministry of Health and Long-Term Care. This classification is known as Section 8. The request is reviewed by ministry staff based on clinical criteria set by the committee, or by external medical consultants, and a decision about reimbursement is made. Committee members vote on each decision, and a simple majority prevails. The minutes of committee meetings and external reviews are confidential. However, if a drug is not listed as a General Benefit drug, the manufacturer is provided with a written summary indicating the main reasons for the committee's decision. Manufacturers may appeal committee decisions. In 1999/2000 the total expenditure by the Ministry of Health and Long-Term Care on drugs was $1.6 billion, and the annual rate of increase during the previous 3 years (despite what some consider an unacceptably restrictive review process) was 10.6%, 9.9% and 10.1% (Fig. 1). In 2000/01, the increase in expenditure was 15% (Linda Tennant, Drug Programs Branch, Ministry of Health and Long-Term Care, Toronto, Ont. : personal communication, 2001). In 1999/2000, 11% of submissions for nongeneric drugs were listed as General Benefit, 27% as Limited Use, and 62% as Section 8 (Linda Tennant: personal communication, 2001). The 10 drugs with the highest reimbursement costs for the ministry in 2000/01 are listed in Table 1. Fig. 1: Total costs, beneficiaries and prescriptions of the Ontario Drug Benefits Program (ODBP) between 1992/93 and 1999/2000. Bars illustrate the annual costs of the ODBP. My 2 years on the Therapeutics Committee have led me to a number of observations, some of which are discussed here. A cost-effectiveness analysis summarizes the health benefits derived from an investment in health care. Many cost-effectiveness analyses are relatively straightforward: most highly effective drugs are cost-effective, and most marginally effective drugs are not cost-effective. For example, although the use of cyclosporine for patients having renal transplantation is expensive, it is also cost-effective, because it is so much better than previous immunosuppressive regimens.1 On the other hand, clopidogrel was only associated with a 0.5% difference in vascular events compared with ASA in the CAPRIE trial.2 Because clopidogrel costs $2.36 per day compared with $0.01 per day for ASA, it is not surprising that clopidogrel is not cost-effective for the primary prevention of stroke. Despite much having been written about the optimal methodology for cost-effectiveness studies,3,4,5,6 my experience suggests that in most instances the subtleties of economic evaluation do not play an important role in decision-making. Analyses that require extensive modelling often include so much uncertainty that they do not provide much help with the decision. The one exception is when multiple sensitivity analyses suggest that the result is unaffected by changes in all key variables. Other than effectiveness, the most important factor that drives a cost-effectiveness analysis is the price charged for a drug. In an ideal world, the drug company would charge a price that reflected the costs of developing a drug, the need for funds for future research to develop new drugs and a reasonable profit margin. I have never seen a submission that explicitly justified the price charged for a drug, so I am left to speculate about how this is done. There appear to be 2 general methods. If there is already a competitor in a similar class on the market, the new drug is usually given a price that is close to that of the existing product. This highlights the importance of the price charged for the first drug in a class, because that will probably determine the price for future drugs in that class and for other drugs used to treat the same disorder. The other method appears to be to guess the maximum the market will bear. This depends upon a complex mix of factors including how “high-profile” the disorder is, how many alternative drugs are already on the market, the price of alternative drugs and what others have suggested may be an attractive cost-effectiveness ratio. Although I and my colleagues have published “tentative guidelines” for what might be considered to be an attractive cost-effectiveness ratio,7 others have pointed out8 that the definition of “cost-effective” can be expected to change with time. Although the Therapeutics Committee does not use an explicit threshold for what is cost-effective, my sense is that the committee's threshold is different from that suggested in our article, for example, $50 000 per quality- adjusted life-year would be considered relatively unattractive. Some industry analysts argue that it is impossible to determine prospectively the true cost of a drug in an accurate fashion because of the unpredictable nature of drug development and that price controls would curtail innovative research.9,10,11 The government is often in a difficult position when trying to balance the desires of health care providers for affordable drugs with the wish to attract pharmaceutical and biotechnology investment to fuel the economy. The best way to determine drug prices from a societal point of view is an issue that deserves more careful policy analysis and rational debate. The price of generic drugs should be evaluated as well. In Ontario, a generic company may charge as much as 63%–70% of the brand name price,12 which seems higher than production costs would justify. In my opinion, there are 4 main reasons why a drug does not receive a General Benefit listing. First, its effectiveness compared with currently available therapies may be relatively small (e.g., clopidogrel versus ASA for primary stroke prevention2). Second, the drug's price may be much higher than the most frequently used comparator drug but only marginally more effective (same example). Third, the drug's effectiveness may not have been convincingly demonstrated. This occurs most frequently either because no head-to-head randomized trials with a frequently used competitor drug have been done or because surrogate markers with uncertain clinical importance have been used as the measure of effectiveness. Fourth, the drug may be only cost-effective in a subgroup of patients, and the committee may be concerned that the drug will be used in a much larger group of patients if it is classified as a General Benefit drug (e.g., COX-2 inhibitors). Among the “top ten” drugs that have the highest total reimbursement costs per year are 2 statins and one angiotensin convertase inhibitor (Table 1). The efficacy of both classes of drugs has been convincingly demonstrated, their use is cost-effective in many patients and, therefore, they are listed as General Benefit drugs. However, this serves to remind us that most cost-effective drugs are not cost saving and that their use in a substantial portion of the population entails a large cost. I am not arguing that these drugs are not good value for money (I prescribe them for my patients regularly), but it is wrong to think that the use of these drugs will save the health care system money. Total costs are determined by the price of the drug, the total number of patients with the disorder(s) for whom the drug has been demonstrated to be cost-effective and the number of patients without that disorder(s) for whom the drug is prescribed. The last-named “prescription creep” is of considerable concern and can be caused by the use of the drug for a disorder for which its benefit has not yet been demonstrated (leukotriene antagonists for patients with chronic obstructive pulmonary disease), or by patients at low risk of an adverse event for whom the cost-effectiveness ratio is unattractive (e.g., the use of COX-2 inhibitors by patients at low risk of a gastrointestinal bleed). Limited Use is a blunt method of influencing the use of some drugs. However, it is much less restrictive than Section 8 and gives physicians the responsibility for appropriate prescribing, within certain boundaries. The committee hopes that the Limited Use criteria will ensure that patients who will benefit the most from these drugs will receive them, while at the same time the overall expenditures will be limited. The downsides of the Limited Use process are the inconvenience to practitioners who must remember the Limited Use codes, the inconvenience to pharmacists who must often contact physicians when the prescriptions are incorrectly filled out, the possibility that some patients who meet the Limited Use criteria will not receive the drug because of the extra paperwork involved and the possibility that some physicians may provide incorrect information on the prescription because they feel that their patient would benefit from the drug (I believe that the last-named occurs infrequently). Although it seems intuitive that Limited Use criteria are effective, there is surprisingly little information available to support their efficacy. Recent information comparing the market share of drugs available as Limited Use products in Ontario with their market share in provinces in which they are classified as General Benefit drugs suggests that the market share is indeed generally lower when the drug is classified as a Limited Use drug (Linda Tennant: personal communication, 2001). Further research is needed in this area, which should include a comparison of the effects of Limited Use criteria with other less proscriptive mechanisms of influencing prescribing, such as practice guidelines. The Therapeutics Committee currently only communicates the reasons for its decisions to the drug manufacturer. I believe that this is a mistake and that the Therapeutics Committee can only gain by making public a brief lay summary of the major reasons why a drug is not listed as a General Benefit drug. Although some will disagree with the decisions, disagreement is common among clinicians when assessing effectiveness, let alone cost-effectiveness. At least everyone will be aware of the reasons for the decision. Indeed, I would support making the Therapeutics Committee meetings open to the public, provided that the committee can continue to function efficiently and that high-quality internal and external reviewers can still be obtained. The views of pharmaceutical companies about open committee meetings would be interesting, because this would automatically mean that the contents of their submissions would be available to their competitors (one of the reasons for the current confidentiality of the deliberations is that some submissions contain information that is not yet in the public domain). Finally, it must be remembered that the Therapeutics Committee only makes recommendations to the minister. Other factors may influence the minister's decisions, and Therapeutics Committee decisions are sometimes (although rarely) overturned. I am convinced that the Therapeutics Committee makes reasonable decisions in what are often very difficult circumstances. The committee must make decisions from a societal perspective, which can be uncomfortable for a practising clinician, but this is essentially no different from the decisions made by the many physicians who take on administrative roles such as chief of staff or head of pharmacy and therapeutics committees. I believe that the Therapeutics Committee should make the reasons for its decisions public, that manufacturers should be encouraged to justify the prices that they charge for their drugs and that a careful policy analysis of drug prices from a societal point of view should be undertaken. Pharmaceutical committees that select drugs for reimbursement by provincial drug benefit programs are just one piece of the puzzle that affects drug use. Others include appropriate prescribing by physicians, involvement in the prescribing decision by patients, methods of encouraging compliance with medications, and responsible drug promotion by the pharmaceutical industry. Acknowledgements: I thank the following for their comments on previous drafts of this article: David Alter, John Conly, Kathy Knowles-Chapeskie, Michael Evans, Anne Holbrook, Gary Naglie, Paul Oh, Don Redelmeier and Christine Rivet. The opinions expressed in this article are those of the author alone and not those of other members of the Drug Quality Therapeutics Committee, the Ontario Drug Benefits Program, the Ontario Ministry of Health and Long-Term Care, or the Institute for Clinical Evaluative Sciences. Competing interests: Dr. Laupacis is a member of the Drug Quality and Therapeutics Committee of the Ontario Ministry of Health and Long-Term Care. Laupacis A, Keown P, Pus N, Krueger H, Ferguson B, Wong C, et al. A study of the quality of life and cost-utility of renal transplantation. Kidney Int 1996;50(1):235-42. CAPRIE Steering Committee. A randomized, blinded, trial of clopidogrel versus aspirin in patients at risk of ischemic events (CAPRIE). Lancet 1996; 348:1329-39. Russell LB, Gold MR, Siegel JE, Daniels N, Weinstein MC. 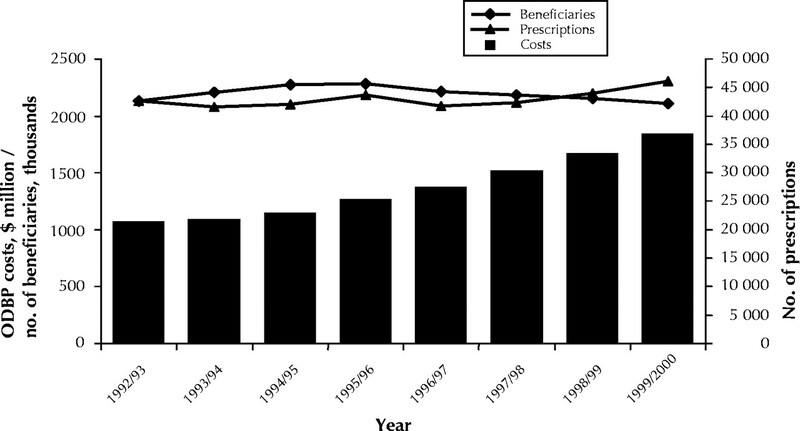 The role of cost-effectiveness analysis in health and medicine. Panel on Cost-Effectiveness in Health and Medicine. JAMA 1996;276(14):1172-7. Weinstein MC, Siegel JE, Gold MR, Kamlet MS, Russell LB. Recommendations of the Panel on Cost-effectiveness in Health and Medicine. JAMA 1996;276(15):1253-8. Siegel JE, Weinstein MC, Russell LB, Gold MR. Recommendations for reporting cost-effectiveness analyses. Panel on Cost-Effectiveness in Health and Medicine. JAMA 1996;276(16):1339-41. Detsky AS. Guidelines for economic analysis of pharmaceutical products. A draft document for Ontario and Canada. Pharmacoeconomics 1993;3:354-61. Laupacis A, Feeny D, Detsky AS, Tugwell PX. How attractive does a new technology have to be to warrant adoption and utilization? Tentative guidelines for using clinical and economic evaluations. CMAJ 1992;146:473-81. Gafni A, Birch S. Guidelines for the adoption of new technologies: a prescription for uncontrolled growth in expenditures and how to avoid the problem. CMAJ 1993;148:913-7. Davidoff F. The heartbreak of drug pricing. Ann Intern Med 2001;134(11): 1068-71. Willison D, Wiktorowicz M, Grootendorst P, O'Brien B, Levine M, Deber R, et al. International experience with pharmaceutical policy: common challenges and lessons for Canada. Ottawa: Health Canada; 2001. Health Transition Fund no NA236. Calfee JE. Pharmaceutical price controls and patient welfare. Ann Intern Med 2001;134(11):1060-4. Ontario Drug Benefit Act. Revised Statutes of Ontario, 1990. Toronto: Queen's Printer for Ontario; 2000 May 12. ch. 0.10. Benzie R. Harris backs review of drug plan. National Post [Toronto] 2001 Jun 12; Sect A:4. You are going to email the following Inclusion of drugs in provincial drug benefit programs: Who is making these decisions, and are they the right ones? Should cost-effectiveness take the blame? Inclusion of drugs in provincial drug benefit programs: Should "reasonable decisions" lead to uncontrolled growth in expenditures? Bodychecking and concussions in ice hockey: Should our youth pay the price?